n a lovely Sunday morning, some years ago, when all the sweet June smells came in through the open church window, an old man with silvery white hair played such a soft, entrancing little air on the organ, as the ushers took the weekly offering, that the listeners held their breath. "What is it?" they whispered. "What is the dainty thing called?" They asked the organist at the close of the service, and he answered: "That was MacDowell's 'To a Wild Rose'--and MacDowell is a composer of whom America may well be proud." Edward MacDowell was born in New York. He had his first piano lessons when he was eight years old. But as soon as he had learned the notes, his mother noticed that it was not exercises that he played, but merry, rollicking airs. When she asked him where he found them, he replied: "In my head and heart." He was even then composing music of his own. His mother did not run to the neighbors at once, crying "My son is a genius." Instead of that she thought: "Dear me, I am afraid Edward will be a Jack-of-all-trades and good at none, for he writes beautiful stories and poems and draws exact likenesses of people. What in the world shall we do with him?" All his music teachers said it would be wicked not to keep him at the piano. But that was easier said than done. When, at the age of fifteen, he went with his mother to Paris, he passed fine examinations for entrance to the French Conservatory and learned the French language in no time, so as to understand the teachers and lecturers. But he was still apt to forget that he went to his classes to listen and spent much time sketching the faces of teacher or pupils on the margin of his note-book. MacDowell was busy one day, over a picture of a teacher who had a large, queerly shaped nose, when the teacher, seeing that the boy was paying no attention to the lesson, darted to his seat and seized the sketch. MacDowell was frightened and imagined he would be punished. But the teacher was not a bit angry when he saw how true the lines were. He asked to keep the paper and a few days later called on Mrs. MacDowell. "Madam," he said, "I have shown the picture your son drew of me to an artist of the School of Fine Arts, and this gentleman is so sure Edward is meant for a portrait painter that he offers to pay all his expenses for three years and to give him lessons free of charge." This was a grand chance for a poor boy. Mrs. MacDowell did not want to make any mistake. She looked at the teacher a minute and asked: "What would you do?" "Why, I am sure he will make a famous piano player." There was the same old tiresome question: if Edward could do three or four things well, how was any one to know which he might do best? Finally the matter was left to Edward. After a good many days of thinking, he decided his life should be given to music. Art was given up, and Edward promised to waste no more time on his drawing. But he was a great reader and liked good books to the end of his days. After study of the piano in Paris, MacDowell went to Frankfort for two years. He had many pupils there, and to one of them he was married. The young married couple crossed the ocean and stayed in Boston long enough for MacDowell to give some concerts. His fingers were like velvet on the keys of the piano, and every one declared he must take part in a grand American concert that was to be given during the Paris Exposition. He did as he was asked, and the French people waved their handkerchiefs and cried in their language: "Good for the little American!" The French people invited him everywhere and begged him to remain in Paris, but from first to last Edward MacDowell was a loyal American, and he returned to Boston, where for eight years he played in concerts, took pupils, and best of all wrote much of the music which makes Americans so proud of him. He became a professor of music in Columbia College, and his piano pieces were played the world over. Many men who write music try to give it a style like some old Italian or German composer, but MacDowell's music does not remind one of any German, Italian, or French writers; it is just itself--it is MacDowell. Some of his music is heavy and grand, but more of it is delicate. It was wonderful to hear MacDowell himself play "To a Wild Rose." A friend who knew how much the composer liked that said once: "Mac, something dreadful happened a few weeks ago. I heard your 'Wild Rose' played at a high school graduation, on a high school piano, by a high school girl--awful!" MacDowell laughed and answered: "I suppose she pulled it up by the roots, didn't she?" MacDowell loved outdoor life, and after he bought a farm at Peterboro, New Hampshire, he built a log cabin way off in the woods, had a grand piano carried there, and in the quiet of that forest wrote some of his sweetest musical sketches. 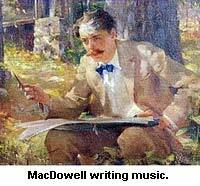 The names of MacDowell's compositions show he loved life under the sky. There are "The Woodland Sketches", "Sea Pieces", "From a Log Cabin", and single titles like "The Eagle", "A Water Lily", and "The Bars at Sunset." MacDowell worked too steadily and died when he was quite young, but he had written enough music to be remembered as a great American composer. He said any man who wanted to write music that described his country must love that country so well that he would put into his notes what the nation had put into its life. He felt that America was a happy, brave, hopeful nation, and he tried to make his music show that. MacDowell was shy and modest and was quite surprised when different colleges made him a Doctor of Music, when great concert players meekly asked him if they played his sonatas as he wished them played, and when medals and jewels were sent him as gifts. A good many studios are now built near MacDowell's log cabin in Peterboro, and musicians and authors stay in the forest through the summer months, liking the quiet spot and hoping the sight of his log cabin may make them work as faithfully for the glory of America as Edward MacDowell did. Even the French artist who wished to make a portrait painter of him must have been glad that MacDowell clung to music, and Mrs. MacDowell found that her Jack-of-all-trades was really master of one.